Dr. Staudinger’s research has addressed a broad range of questions related to the ecology and conservation of marine ecosystems spanning local to global scales, including trophic interactions in community ecology, climate change impacts on biodiversity, bioaccumulation of mercury in marine food-webs, and addressing climate related uncertainty in natural resource management using decision frameworks. 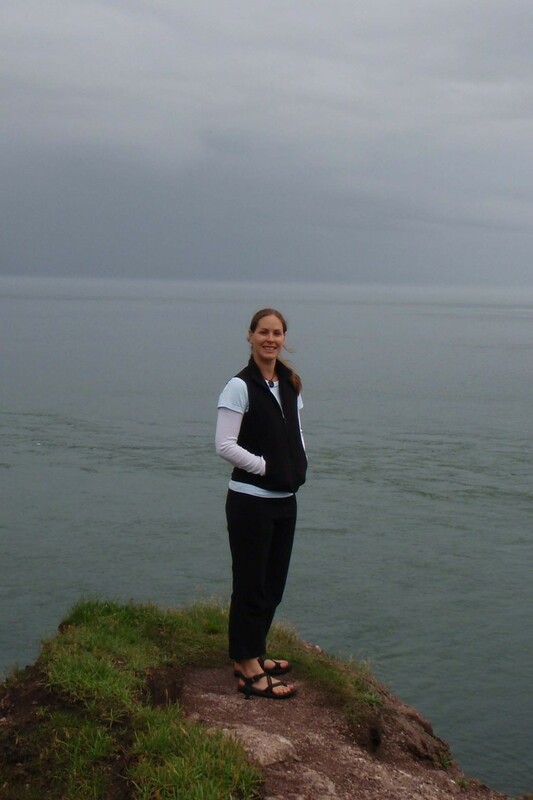 Dr. Staudinger received her Ph.D. in Marine Science and Natural Resources Conservation from the University of Massachusetts Amherst in 2010. Since then she has held positions as a Visiting Research Assistant Professor in the Department of Biology and Marine Biology at the University of North Carolina Wilmington, as well as a joint post-doctoral fellowship with the USGS National Climate Change and Wildlife Science Center and University of Missouri Columbia. She is currently a USGS Ecologist and Science Coordinator of the Northeast Climate Science Center located at the University of Massachusetts Amherst. Powell, E., M. C. Tyrell, A. Milliken, J.M. Tirpak, and M.D. Staudinger. In review. A synthesis of sea level rise and storm thresholds for 44 focal species along the U.S. Atlantic and Gulf coasts: A review of research and application. Ocean and Coastal Management. Shea, E.K., H. Judkins, M.D. Staudinger, V. Hartigan, A. Lindgren, and M. Vecchione. In press. Cephalopod biodiversity in the vicinity of Bear Seamount, western North Atlantic. Marine Biodiversity. Alexander, K.E., W.B. Leavenworth, C. Hall, S. Mattocks*, S.M. Bittner, E. Klein, M.D. Staudinger, A. Bryan, J. Rosset, T. Willis, B.H. Carr, and A. Jordaan. 2017. Tambora and the mackerel year: Phenology and fisheries during an extreme climate event. Science Advances, 3: e1601635. Beever, E.A., O’Leary, J., Mengelt, C., West, J., Julius, S., Green, N., Magness, D., Petes, L., Stein, B., Nicotra, A.B., Hellmann, J.J., Robertson, A.L., Staudinger, M.D., Rosenberg, A.A., Babij, E., Brennan, J., Schuurman, G.W., and G.E. Hofmann. 2016. Improving conservation outcomes with a new paradigm for understanding species’ fundamental and realized adaptive capacity. Conservation Letters, 9(2):131-137. Grimm, N.B., Groffman, P., Staudinger, M.D., and H. Tallis. 2016. Climate change impacts on ecosystems and ecosystem services in the United States: process and prospects for sustained assessment. Climatic Change, 135: 97–109. Teffer, A.K., Staudinger, M.D., and F. Juanes. 2015. Trophic niche overlap among dolphinfish (Coryphaena hippurus) and co-occurring tunas at the northern edge of their range in the western North Atlantic Ocean. Marine Biology, 162(9): 1823-1840. Thompson, L. M., Staudinger, M.D., and S. L. Carter. 2015. Summarizing components of U.S. Department of Interior vulnerability assessments for targeting climate change adaptation planning. U.S. Geological Survey Open-File Report 2015-1110. Butler, C.M., Logan, J.M. Provaznik, J.M., Hoffmayer, E.R., Staudinger, M.D., Quattro, J.M., Roberts, M.A., Ingram, G.W., Pollack, A.G., and M.E. Lutcavage. 2015. Atlantic bluefin tuna (Thunnus thynnus) feeding ecology in the northern Gulf of Mexico: A preliminary description of diets from the western Atlantic spawning grounds. Journal of Fish Biology, 86: 365-374. Teffer, A. K., Staudinger, M.D., Taylor, D.L., and F. Juanes. 2014. Trophic influences on mercury accumulation in top pelagic predators from offshore New England waters of the northwest Atlantic Ocean. Marine Environmental Research, 101: 124-134. Staudinger, M.D., McAlarney, R., Pabst, A., and W. McLellan. 2014. Foraging ecology and niche overlap in pygmy (Kogia breviceps) and dwarf (Kogia sima) sperm whales from waters of the U.S. mid-Atlantic coast. Marine Mammal Science, 30(2): 626-655. Staudinger, M.D., Hanlon, R.T., Mathger, L., and K. C. Buresch. 2013. Defensive responses of cuttlefish to different teleost predators. Biological Bulletin, 225: 161–174. Staudinger, M.D., Carter, S., Cross, M., Dubois. N., Duffy, E., Enquist, C., Griffis, R., Hellmann, J., Lawler, J., Morrison, S., O’Leary, J., Stein, B., and W. Turner. 2013. Biodiversity in a changing climate: A synthesis of current and projected trends in the United States. Frontiers in Ecology and the Environment, 11(9): 465-473. Grimm, N., Staudinger, M.D., Staudt, A., Carter, S., Chapin, F.S.III, Kareiva, P., Ruckelshaus, M., and B. Stein. 2013. Climate-change impacts on ecological systems: Introduction to a US assessment. Frontiers in Ecology and the Environment, 11(9): 456-464. Staudinger, M.D., Juanes, F., Salmon, B., and A. K. Teffer. 2013. The distribution, diversity, and importance of cephalopods in top predator diets from offshore habitats of the Northwest Atlantic Ocean. Deep Sea Research II, 95: 182–192. Hanlon, R. T., Buresch, K., Moustahfid, H. and Staudinger, M.D. 2013. Doryteuthis pealeii, Longfin inshore squid. In: Rosa, R., Pierce, G., and R. O’Dor (eds) Advances in Squid Biology, Ecology, and Fisheries. Nova Science Publishers, Inc. Hauppauge, NY. Staudinger, M.D. 2011. Species- and size-specific variability of mercury concentrations in four commercially important finfish and their prey from the northwest Atlantic. Marine Pollution Bulletin, 62: 734 – 740. Staudinger, M.D., Hanlon, R.T., and F. Juanes. 2011. Primary and secondary defenses of squid to cruising and ambush fish predators: variable tactics and their survival value. Animal Behaviour, 81: 585-594. Staudinger, M.D., and F. Juanes. 2010. Size-dependent susceptibility of longfin inshore squid (Loligo pealeii) to attack and capture by two predators. Journal of Experimental Marine Biology and Ecology, 393: 106-113. Staudinger, M.D., and F. Juanes. 2010. A size-based approach to quantifying predation on longfin inshore squid (Loligo pealeii) in the northwest Atlantic. Marine Ecology-Progress Series, 399: 225-241. Staudinger, M.D., and F. Juanes. 2010. Feeding tactics of a behaviorally plastic predator, summer flounder (Paralichthys dentatus). Journal of Sea Research, 64 (1): 68-75. Staudinger, M.D., Juanes, F., and S. Carlson. 2009. Reconstruction of original body size and estimation of allometric relationships for the longfin inshore squid (Loligo pealeii) and northern shortfin squid (Illex illecebrosus). Fishery Bulletin, 107: 101–105. Moltschaniwskyj, N.A., Hall, K., Lipinski, M. R., Marian, J.E.A.R., Nishiguchi, M., Sakai, M., Shulman, D.J., Sinclair, B., Sinn, D.L., Staudinger, M.D., Van Gelderen, R., Villanueva, R., and K. Warnke. 2007. Ethical and welfare considerations when using cephalopods as experimental animals. Reviews in Fish Biology and Fisheries, 17: 455-476. Staudinger, M.D. 2006. Seasonal and size-based predation on two species of squid by four fish predators on the Northwest Atlantic continental shelf. Fishery Bulletin, 104 (4): 605-615.